This is a lovely sparkling, light-bodied, fruit wine. 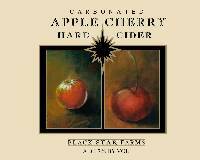 Not too sweet, this semi-dry cider uniquely combines the fresh crisp flavors of local apples and cherries. Sweet apples and cherries combined with a bit of tanginess in the finish. Enjoy this wine with cheese and fruit plates, luncheons, and BBQ foods. It is also wonderful as a mulled wine during the cooler months. Try this recipe. From Nicole of MACOMB , Michigan on 8/15/2017 . From Cody of Cincinnati, Ohio on 9/18/2016 . Very good wine. Tastes like cider beer but without the tart aftertaste. From Nicole Wheeler of Chesterfield , Michigan on 1/3/2016 . 10/4/2018 – Is this best enjoyed chilled? 9/3/2017 – Is there hops in the apple cherry hard cider?